The library is located on the first floor of the Canterbury block where the 6th Form is located on the ground floor. It is a light, bright and airy space, with seating for over 60 students as well as study tables and computers. The Library is a safe and supported environment for both students and staff to work, read or carry out research from books and computers. Students should work quietly at all times and respect the needs of others to keep this place a peaceful environment. There is a quiet study area for 6th Formers and a Staff Work Area. The Library is open daily from 8am to 4.30pm. 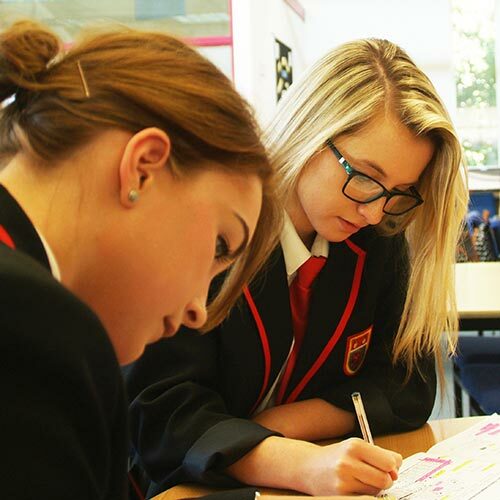 An Accelerated Reading Scheme (AR) has been introduced to the curriculum to help improve standards, to help those students who are struggling or who are reluctant readers. For more information please click logo above to access the AR website. Eclipse library software gives students access to the library resources catalogue. Click logo above to view. Fiction, non-fiction and text books, magazines, journals and daily newspapers are available in the library. Students may borrow up to 2 books for 2 weeks. Students have access to computers and a printer during break times, as well as before and after school. 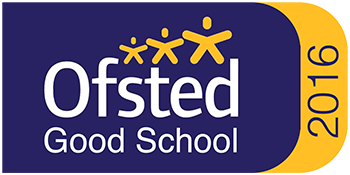 They have their own space to store files and are provided with their own log-ins at the beginning of Year 7 or when they join the school. E-mail addresses are assigned to each student which they can access at school, at home or any computer connected to the internet. Homework Club runs on Monday to Thursday from 3.20 – 4.30pm, where computers and books can be used to help with homework. Stationery Shop – a wide selection of pens, pencils, paper, calculators etc are available to buy from the Library counter at cost price, during break times. The library also issues locker keys for a fee at the beginning of each academic year. The school’s Careers Information Service is located at the back of the Library. The Maths & English Mentors are also located in an office within the Library. The Library runs various events, quizzes and book reading groups, time permitting. 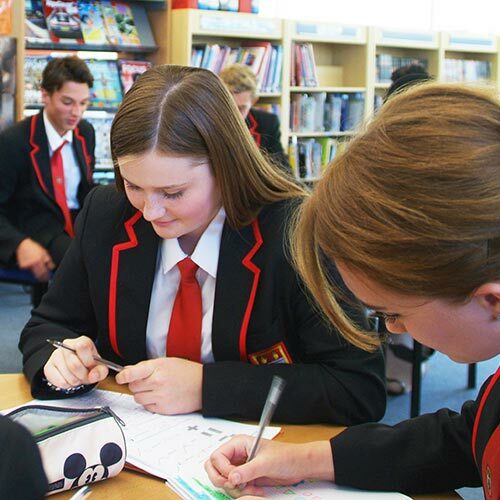 The school subscribes to Devon School Library Service, where topic collections can be ordered by staff to support the curriculum subject they are teaching. All new students undergo a Library induction; it teaches them how to find resources and conduct research both through books and the Internet. The shelving system is explained – fiction books alphabetically by author’s surname and non-fiction using the Dewey Decimal System of numbers for subjects. 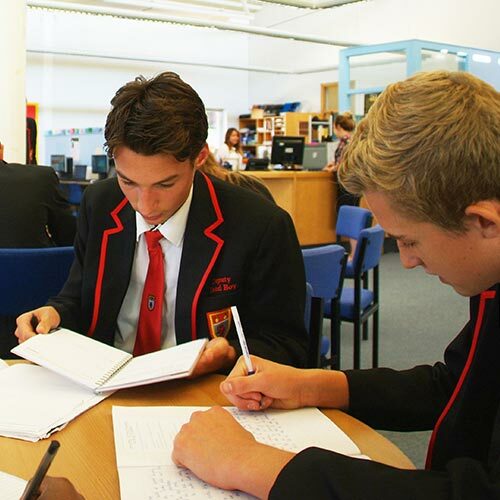 6th Formers also undergo an induction at the beginning of the academic year, that includes writing and understanding of bibliographies and referencing. Students wishing to visit the Library during lesson time should fill out a slip with a teacher’s signature (except 6th Form). The library runs a display for Author of the Week; these books can be borrowed by students and then they can write a review that could be posted on the library website. The library is for research, personal study or quiet reading. No eating or drinking (only bottled water). Leave the library tidy – put books back where you got them from. Do not move the tables & chairs. Mobile phones must be switched off or set to silent. Do not take calls in the library. Computers must NOT be used for playing games. Only print what you need. DO NOT WASTE PAPER! Books taken from the library must be properly issued at the Library Desk.